Tamiko Beyer asks, I love your “Chinese Silence” poems for their fierce, funny, and beautiful assertions of our API presence. In these poems you are—and we are—raising our voices in a culture that would have us be silent and docile. In thinking about the visceral casting off of this “Chinese Silence,” I wondered: if these poems were to manifest in music, what would that sound like? What voices, instruments, and sounds would compose it? What kind of playlist would reflect your voice and your work? If you were to expand it out to a community playlist of an “Asian American Roar,” would you have any rules or guidelines for it? If it were to live on the internet, where would it live? Timothy Yu responds, Sometimes I think that the antithesis of “silence” is not “loudness” but something more subtle and menacing, like a creepy undertone in a familiar song—or like the “Jaws” theme, something you initially barely notice is there but that gradually intrudes on your consciousness, making you uneasy for some reason you can’t quite put your finger on. While I’d love for these poems to enable an Asian American roar, I think that what they’re trying to do is more like undermining the music of American poetry, from the inside out. Like hitting a bunch of dissonant notes in “America the Beautiful.” Or the way John Cage uses silences as a kind of music. Asking what it is that our silence says might be a way of clearing the way for us to make our own playlists. will compose our silent poems. 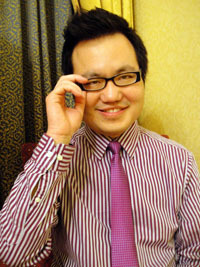 Timothy Yu is the author of 15 Chinese Silences (Tinfish) and Race and the Avant-Garde (Stanford) and teaches at the University of Wisconsin-Madison.